Heat oven to 350°F. In ungreased 12x8-inch (2-quart) baking dish, combine tomatoes and gravy; mix well. Add all remaining ingredients; stir gently to coat with tomato mixture. Cover tightly with foil. Bake at 350°F. for 50 to 60 minutes or until meatballs are thoroughly heated and vegetables are tender. There are several brands of frozen meatballs to choose from. Just make sure that the label indicates that the meatballs are fully cooked. One 4.5-ounce jar of sliced mushrooms, drained, can be used in place of the fresh mushrooms. 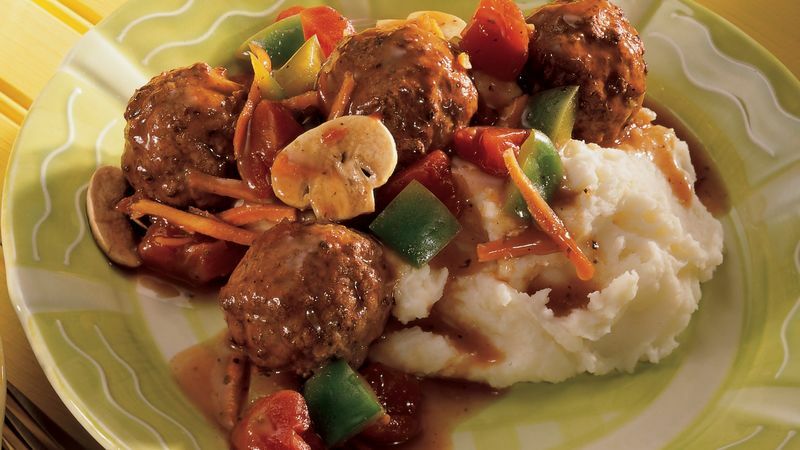 These baked meatballs with gravy are delicious with mashed potatoes. To complete the meal, slice fresh apples and pears into wedges, or serve cups of fruit cocktail.